Skrill is an international system for online payment via e-mails. It was established in 2001 in Great Britain and was known as Moneybookers until 2011. It attends both physical people and companies and gives them the opportunity to send and receive money in real time. Skrill is the most widespread payment method in the gambling industry due to its safety, accessibility, low charges, swiftness and convenience. Let’s examine the main features of the system and the terms for its usage. Click on the “Sign up” button at the top of the screen on the left. A new page will be opened on which you have to fill out your personal data and account details: currency and language. You can change the language on the Skrill website at any point, but once you choose a currency- it cannot be changed. It is important that you choose the optimum currency- it is better to choose your local currency, the same as your personal finances, or the same as the currency you use for the accounts you have in the gambling operators. There should be no problem if you use a different currency for your Skrill account, for instance, your account in the gambling operator is in USD and your Skrill account- in GBP. However, there would be a small charge for converting the currencies. On your registration you are asked to give your e-mail which is used as verification in the system. After you have opened your account, you will notice that there are limits for the various financial operations. These are the maximum funds you can use for one transaction or for a definite period of time. To use all the options of the system and increase the amount of money you can transfer, you have to verify your personal data. This is the same verification as with the operator. You have to send scanned copies of your personal ID card, utility bill, bank statement and credit/debit cards, if you plan to use such. You have to follow the instructions described on the website of the system. In order for you to make the most of your e-wallet, Skrill ensures the integration of all payment instruments you are using- bank accounts, credit and debit cards, as well as local systems for electronic banking. For that purpose you have to register these cards and/or accounts in the system. Choose the specific options from the menu and follow the instructions. Skrill offers to make a Master card for you to have a constant access to your funds in the system. Your Skrill account is activated on your first paying funds to it. To do so, you have to click on the “Upload” button on the menu. A list with the possible methods according to your location should appear. The most popular and accessible methods almost anywhere in the world are credit/debit cards and bank transfers. If you choose a card, the payment is performed instantly, the funds being transferred from the card you have registered to the Skrill system. Your balance is instantly updated and you can make transactions to other Skrill clients. If you prefer to fund your account vie bank transfer, you should bear in mind that it might take a few days for the actual transfer to be completed. For the convenience of their clients, Skrill has various bank accounts in dozens of countries. The clients make local bank transfers to the Skrill accounts in local currencies and thus omit international transfer fees. To fund the Skrill account via bank transfer, choose the respective option from the menu and you should find detailed instructions there. You can withdraw e-money from Skrill and receive your actual money at any time you wish. This could be performed by analogy with the payment to the account- via your debit/credit card or bank account. Use the “Withdraw” button from the menu and follow the instructions to request the withdrawal. If you have a Skrill Master card, you can withdraw money from an ATM at any time, or make non-cash payments. You can make instant transfers to other clients of the Skrill system at any time. 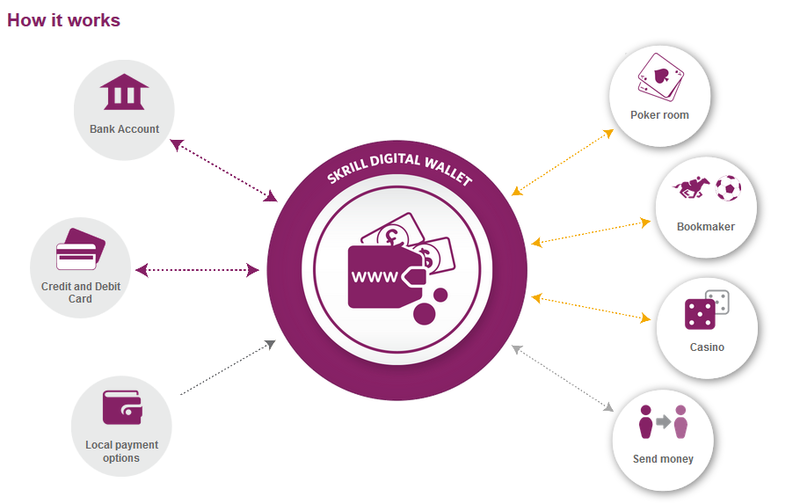 This is the most advantageous part of the Skrill system, being an e-wallet. You can make all your online payments via the Skrill system; it’s sometimes even safer, easier and cheaper than credit/debit cards. You can make transfers to other physical clients of the Skrill system; pay your utility bills, goods or services when you shop online. You can make payments to your accounts in the gambling operators, and respectively receive your winnings in your Skrill account. The low transfer fees inside the system are really impressive. When you make a transaction to another client of the system, your fee would be 1% at the amount of the sum, but no bigger then EUR 0.50. To use this option, follow the “Send Money” button; insert the receiver’s e-mail, name and the sum to be transferred. When you make a transaction to a company or a gambling operator, the whole process is facilitated, automated and free. Choose the respective payment option on the website of the merchant/operator and simply follow the instructions of the user-friendly interface.